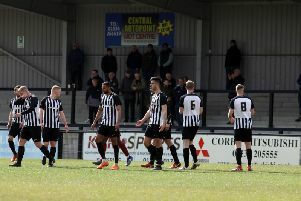 Stevie Noble is hoping Corby Town can cap an incredible season for football in north Northamptonshire by winning the Evo-Stik Southern League Premier Division title on Saturday. The Steelmen head to Poole Town knowing only a win will do as they aim to become champions. The Dolphins moved back to the top of the table by virtue of their superior goal difference after a 0-0 draw at Weymouth on Tuesday night. But Corby will go in search of the win that will see them lift the title and add to what has already been a magnificent campaign for the local area. Kettering Town have already won the Southern League Division One Central title, AFC Rushden & Diamonds are the ChromaSport & Trophies United Counties League Premier Division champions and Rothwell Corinthians are also gunning for promotion in the UCL Division One this weekend. Despite the obvious local rivalry, Noble believes Corby have built “good relationships” with their neighbours over the past few months. And he hopes his club, who have battled back from financial problems at the end of last season, can help round off a memorable campaign this weekend. “I was with (Northants FA chief executuive) Kevin Shoemake on Sunday and we were talking about what a fantastic season it has been for Northamptonshire football,” the Steelmen chairman said. “We were fortunate enough to not quite have to go to the really dark places that Kettering and Rushden & Diamonds had to go before they could bounce back. “But Kettering and AFC Diamonds have had amazing seasons and the people behind the scenes at both clubs deserve the success they have had. “We have built up a very good relationship with both clubs during this season and, whether people agree or not, that is the way it should be and long may it continue.